Mike Souchak, age 81, passed away Thursday in Florida. He was born in Pennsylvania, went to college in North Carolina, lived for a while in Michigan, then spent the last 35 years of his life in Florida. He had no connection to Texas, really, except that he seemed to enjoy playing golf there. And his victory at the 1955 Texas Open is legendary: He set all kinds of scoring records that week - for nine holes, for 18 holes, for 72 holes, for score in relation to par. This bio of Souchak goes over those records and other elements of Souchak's career. In Texas, there was mud. So much of it that the players hit their tee shots off mats all week. Where there wasn't mud, the ground was frozen. "The weather that week was pretty tough—horrible, in fact," says Arnold Palmer , who finished sixth. "It snowed, and it was very muddy. You were two inches taller when you finished than when you started with that great Texas caliche on your golf shoes." San Antonio had been sunny on Thursday and Friday, but toward the end of Saturday's third round a two-club blue norther came rolling in, changing everything. "It caught me on the 14th hole, and the temperature dropped 15, 20 degrees," Souchak says. "It got damn cold by the time we finished." Still, he birdied two of the last five holes for a 64. That night it snowed, a light dusting that greeted the players when they awoke for the final round. "I've seen more rain and I've seen more wind," says 1959 PGA champion Bob Rosburg , "but the combination, there wasn't much worse than that." Rosburg , who was paired with Souchak on Sunday along with Canadian pro Jerry Kesselring, had to stop frequently to pry the mud off his cleats, using a knife he'd lifted from the breakfast table. Players heated their hands over fires that were built on the tees. It was so cold that 10 players called it quits. Rosburg was almost one of them. He was four over as he trudged up the fairway of the par-5 9th, and he was cold. "Souch, I'm not playing very well," Rosburg said. "I'm going to quit." Souchak was alarmed. Rosburg had won on Tour and was a calming influence, and his departure would leave Souchak with only Kesselring, who was lost in the middle of a 77. "Don't you dare quit, Rossi," Souchak said. "I'm about to win my first tournament, and I'm scared half to death. Don't leave me. Everybody else is playing poorly too." Rosburg eagled the 9th and decided to play on. Souchak , of course, won easily, and he set one of the most enduring records in the game. 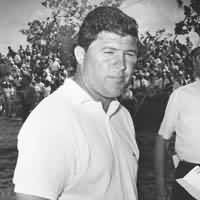 A former lineman and kicker at Duke, he shot 60-68-64-65 for a 257. "We all knew it was an amazing score," says Peter Allis.